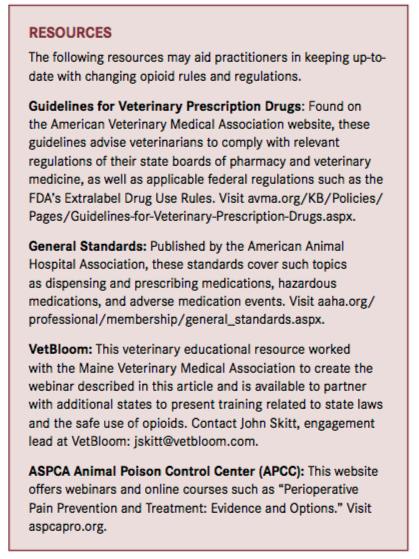 The Maine Veterinary Medical Association (MVMA) put out a position statement against the state’s PMP law, writing that while the “opioid epidemic is a serious public health crisis that requires all prescribers and dispensers of opioids and benzodiazepines to assist in preventing the misuse or diversion of these drugs, [veterinarians] are ineffective participants in reducing drug abuse by the public [because they] do not have the human medical exposure or back- ground to review medical prescription information for animal owners.” In an interview with American Veterinarian®, Katherine Soverel, executive director of the MVMA, said that including veteri- narians could dilute the data and make the PMPs less effective. Amanda Bisol, VMD, director and legislative chair for MVMA, knows well that many consider the new legislation unfair to their profession, but she says veterinarians should take the problem seriously and consider how they can help. She urges veterinarians to look for a balance of drugs for in-hospital use, including drug classes such as nonopioid analgesics and steroidal and nonsteroidal anti-inflammatory drugs. When prescribing opioids for external use, she said, veterinarians should make sure they understand and comply with the strictest state and federal standards. Even if they seem too strict, she said, veterinarians must comply. “It’s better to be part of the solution than to risk being a part of the problem,” she said. Veterinarians in all states need to be aware of new legislation—including laws under consideration—regarding the use and prescription of opioids, which might entail training. Maine’s new law requires that veterinarians, along with other prescribers and dispensers of opioids, receive 3 hours of opioid CE every 2 years. As a result, MVMA has partnered with VetBloom, an educational platform owned by Ethos Veterinary Health, a network of hospitals providing specialty and emergency pet care. Directed by Patrick Welch, DVM, MBA, DACVO, VetBloom developed a variety of curricula to meet the needs of veterinarians in New England. Completing an online webinar, created for and with MVMA, enables MVMA members to maintain their state license. The second part, developed by Jennifer Kelleher, PharmD, BCPS, FSVHP, formerly with Ethos and now a compounding pharmacist and educator, describes the legal nuances and recommendations for administering opioids in a veterinary clinic. It explains the requirements and considerations for dispensing opioids to clients, covers the steps for prescribing Schedule II–IV opioids using the Maine PMP, and discusses the requirements for electronic, hard-copy, telephone, and faxed opioid prescriptions in the state. Beyond being aware of the legalities, veterinarians must understand the everyday practicalities of when and why opioids are recommended and how to avoid problems. With new drugs being introduced constantly, veterinarians must stay current, Dr. Epstein said. Tapentadol, for example, a new class of analgesic for humans, has shown some utility in animal models. A sustained-released injectable buprenorphine may be available soon, as well. Even veterinarians who feel removed from the opioid crisis would be well served to become knowledgeable about and comfortable with the use of these drugs. By staying current with local, state, and national laws, veterinarians can be strong advocates for the responsible use of opioids and an important part of the conversation around the epidemic. Dr. Shadle earned her PhD in interpersonal and organizational communication from the State University of New York at Buffalo. Dr. Meyer earned his PhD in communication studies and speech arts from the University of Minnesota. They write and train through Interpersonal Communication Services, Inc. (veterinariancommunication.com). They have trained veterinary professionals at numerous national and international conferences. Rudd RA, Seth P, David F, Scholl L. Increases in drug and opioid-involved overdose deaths - United States, 2010-2015. MMWR Morb Mortal Wkly Rep. 20l6;65(5051):1445-1452. doi: 10.15585/mmwr.mm655051e1. Mercola J. Is PetMed selling opiates for people, not pets? Mercola website. articles.mercola.com/sites/articles/archive/2017/09/12/petmed-selling-opiates.aspx. Published September 12, 2017. Accessed February 15, 2018. Edelman A. Pet connection: opioid addicts score drugs from the local vet. NBC News website. nbcnews.com/news/us-news/pet-connection-opioid-addicts-score-drugs-local-vet-n798211. Published September 3, 2017. Accessed February 15, 2018. Kelly M. Opioid addicts turn to pet medications to get high. WPBF News website. wpbf.com/article/opioid-addicts-turn-to-pet-medications-to-get-high/10274777. Published July 9, 2017. Accessed February 15, 2018. Morgan R. People are now maiming their pets to score drugs. New York Post website. nypost.com/2017/01/16/people-are-now-maiming-their-pets-to-score-drugs/. Published January 16, 2017. Accessed February 15, 2018. Mercer M. When addicts steal their pet’s painkillers, what’s a vet to do? The Washington Post website. washingtonpost.com/national/health-science/when-addicts-steal-their-pets-painkillers-whats-a-vet-to-do/2017/09/15/009c5956-8cd4-11e7-91d5-ab4e4bb76a3a_story.html?utm_term=.f189f824afc9. Published September 16, 2017. Accessed February 15, 2018. Bode K. Puppy overdoses after ingesting opioid on morning walk. Eagle-Tribune website. eagletribune.com/news/merrimack_valley/puppy-overdoses-after-ingesting-opioid-on-morning-walk/article_83b24095-9294-54b1-a62d-81971efc54dd.html. Published October 24, 2017. Accessed February 15, 2018. Gregory J. New Jersey law limits initial opioid prescriptions to five days. HealthExec website. healthexec.com/topics/care-delivery/nj-law-limits-initial-opioid-prescriptions-five-days. Published February 16, 2017. Accessed February 15, 2018. King K. New Jersey seeks to expand opioid prescription monitoring to veterinarians. Wall Street Journal website. cetusnews.com/news/New-Jersey-Seeks-to-Expand-Opioid-Prescription-Monitoring-to-Veterinarians-.ryl-3cVhhW.html. Published October 11, 2017. Accessed February 15, 2018. O’Shea T. New Jersey enacts strict opioid prescribing law. Pharmacy Times website. pharmacytimes.com/contributor/timothy-o-shea/2017/02/new-jersey-enacts-strict-opioid-prescribing-law. Published February 20, 2017. Accessed February 15, 2018. Prevention of prescription drug overdose and abuse. National Conference of State Legislatures website. ncsl.org/research/health/prevention-of-prescription-drug-overdose-and-abuse.aspx. Published May 23, 2016. Accessed February 15, 2018. Epstein M. CVC highlight: opioids: the good, the bad, and the future. DVM360 website. veterinarymedicine.dvm360.com/cvc-highlight-opioids-good-bad-and-future. Published December 1, 2011. Accessed February 15, 2018.